English Language, Equestrian & Teens Surf Camp - Donegal, Bundoran Guests overall rating: ★★★★★ 4.8 based on 6 reviews. Bundoran, popularly known as Ireland’s Premiere Seaside Resort and Surf capital, is located on the shores of the board Atlantic Ocean. It’s an ideal place to visit or simply to relax combining the stay of your son with an intensive and useful english language course. The surrounding areas offers a wealth of activities and facilities to suit all tastes (surfing & horseback riding) and Ireland is the perfect place to improve your language skills with a: general english course, PET and First certificate course, business english course, EILTS certification course, and more… not only for children and teenagers but for adults too. 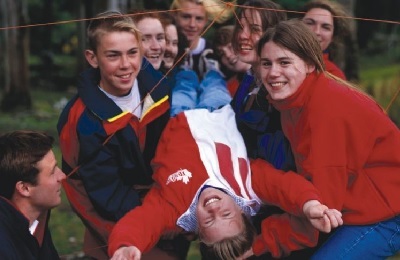 Here, with more than 25 years of experience, the school provides the highest quality courses. Ensuring to your son individual attention,as per each student. Language learning is an individual matter and the school takes this into account from the first contact. Giving a personal touch and monitoring his progress closely… looking after his practical needs and questions. Particular attention is given to issues of interest to teenagers and everyday English speaking situations. A unique opportunity to meet students from all over the world enjoying the surf and the horseback riding, in a safe, vibrant and fun environment… Why spend only a week? The School’s residence in Donegal is situated just close to the Atlantic coast in a quiet suburb and ten minutes from the town centre ( there is a pedestrian walkway from the houses along the seafront to the town center). The students stay in this residential accommodation which is situated less than one minute walk from the Atlantic coast. The English school of the centre has a wealth of experience working with various students from a diverse range of cultures and nationalities. 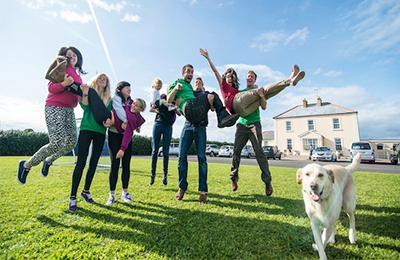 All host families are personally known to us and ensure a warm Irish welcome to all guests. Generally there are1/2/3 junior students per family. Juniors residing at host family have their lunch and dinner at the residential centre three evenings per week in order to ensure that they mix well with the other students. “Our aim is to ensure your surfing skills progress in a fun and safe environment”. A very good surf school to learn how to surf in safety and fun environment, with high quality coaching from experienced local teachers. You will be able to achieve your surfing goals by keeping groups small and providing personal attention to each student. Regular feedback is given to students to ensure progression at all times. We have a range of different boards for you to try, so you can progress your skills. As a part of the methodology, Instructional Surf Videos will be used in the course, photo and filming analysis for students of intermediate level upwards. “At this level our goal is to get you surfing the white water on your own, with a basic knowledge of currents, etiquette and technique”. Paddle, getting through the waves and take off. “For students who aims to improve their level and ocean awareness”. “For Students that already have a high level of confidence able to comfortable catching a wave, locate currents and be aware of behaviour in the water”. Your typical day will start with a copious breakfast to prepare you for English classes from 9:15 – 12:30. Followed up with delicious lunch to charge you up for an afternoon surf session. You will be back to the campus around 5pm to relax and have some snacks. Dinner is served at 18:30 and followed up with some evening activities. The Equestrian Centre is BHS and AIRE approved. Some of the best riding terrain in the whole of Ireland including, a 10 km beach and 1000 sq acres of rolling sand dunes on our doorstep, mountain, lake and forest trails all within a short distance of the yard. Each student is individually tested and placed in a class level appropriate to their abilities. The progress of each student is frequently monitored so that there is always an academic challenge throughout their stay. The english classes will be taught 3 hours in the morning or afternoon according to each student level. The school is recognized by the Department of Education and Science for the teaching of English as a Foreign Language and also a recognised member of MEI/RELSA and ACELS. 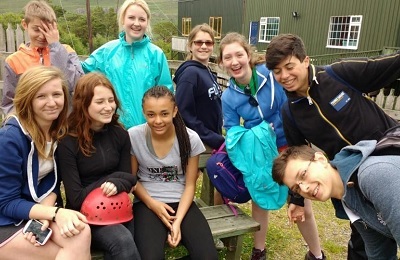 Our evening activities include water sports, onsite discos, bowling, treasure hunts, cinema, art and music workshops, talent shows, silly Olympics, outdoor sports, DVD’s etc. During the evenings is easy to join and enjoy the Irish culture with live music concert, clubs, shows, restaurants and more. The Language, Equestrian & Surf Centre is located in Bundoran, Donegal Co. on Irelands scenic North Western coast. Considered by many as the Surf Capital of Ireland, Bundoran is situated on the South shore of Donegal Bay against the backdrop of the majestic Ben Bulben mountain range. It has become famous the world over for the excellence of it’s waves and many International Surfing Competitions have been held here. 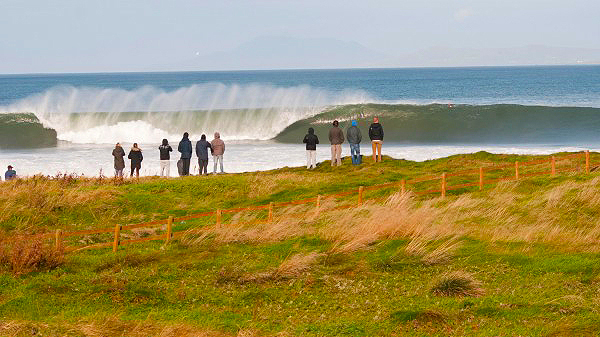 Bundoran is also popularly known as Ireland’s Premier Seaside Resort. County Donegal presents an ever-changing spectacle of landscapes and seascapes set against a backdrop of mountains and moors, with evidence everywhere of traditional Irish culture. Donegal boasts a vast rugged coastline softened regularly by a succession of beautiful beaches with golden sand and clear fresh waters. A flagship and natural attraction, the Slieve League cliffs are the second highest sea cliffs in Europe, while Donegal’s Malin Head is the most northerly point on the island of Ireland. Besides being the cradle of traditional music, including leading singer Enya, Donegal boasts several national parks, such as the Glenveagh National Park, and is home to the famous O’Donnel Clan. The climate is temperate and dominated by the Gulf Stream, with cool damp summers and mild wet winters. Mean temperatures range between 10ºC and 20ºC . Your hosts organize supervised transfers to/from Dublin airport every Sunday between 10am – 6.00pm. Other days of the week, available upon request. Collections are between 10am – 5.30 pm and drop offs are between 11am – 6 pm (these times may vary slightly off season). Knock Airport: Sunday Arrivals Only, Travel time: 1.5 hours, Price: 95 EUR per way for a private transfer or €50 per person. Belfast: Travel time: 3 hours, Price: 240 EUR per way. Collections available from Ballyshannon between 10 am – 8 pm every day. All students are advised to get a travel insurance policy that covers medical expenses, repatriation, loss or theft of property and cancellation or curtailment of course. Students from EU countries should also bring a European Health Insurance Card which covers public medical care. There is a great variety of programs for juniors (11-17 years). Programs feature English classes, accommodation, full board and various types of afternoon activities like surfing, horseback riding and more. This Junior Course is available at Easter Break, and June-September. The English & Surf programme is suitable for students of beginner to intermediate level. If advanced surfers come outside of these dates, their lessons will be at intermediate level. There is a €40 extra host family placement fee per week for July and August only. This Junior Course is available at Easter Break and June-September. The English and Riding programme is suitable for students with some riding experience (competent at canter and above.it is not suitable for beginners). This Junior Course is available June-September. A number of longer duration program, that combine English lessons and various activities in one package. A great way to enrich the stay and to keep new experiences flowing. Minimum length of stay – 2 weeks. This Junior Course is available at Easter Break, and June-September. Minimum stay – 2 weeks. This Junior Course is available at Easter Break and June-September. Minimum stay – 2 weeks. Junior residential | Next to Atlantic coast | 3 minutes’ walk to school |15 minutes’ walk to town centre | 4 bedroom houses | very spacious | sitting room | dining room |well equipped kitchen | Free WIFI in some houses | 3 – 4 students per room | 3 – 4 bathrooms per house | 8 – 11 students & 1 Coordinator per house | Breakfast is provided in the house | Lunch & dinner in the school canteen. Host Family | home from home experience | breakfast and 4 dinners with family | lunch at the school canteen Monday to Friday | packed lunch on Saturday | Lunch on Sunday with family | 3 evenings a week dinner at the residential centre followed by an activity | Students are either picked up by the family or brought home by school bus. There is a €40 supplement for host family per week in June, July and August. No refund will be made if a student makes alternative accommodation arrangements during their stay with us. No allowance is made for absence during stay or for late arrival or early departures. Advanced surfing dates are 10-24 June | 12 August – 2 September. If advanced surfers come outside of these dates, their lessons will be at intermediate level. Riding is suitable for students with some riding experience (competent at canter and above. It is NOT suitable for beginners). Due to some changes in Irish law, our surf classes will now only operate on soft top boards. The boards for intermediate to advanced students are Torque boards. If students want to surf on a hard board or bring their own board, we will operate and advanced surf camp August 11th – 25th. For insurance reason the ratio of these classes must be 1 instructor to 6 students, so there will be a €110 supplement per student per week for this camp. Transfers are grouped together, students will have to wait for the arrival/departure of other students. public bus every two hours costs €16 | Free collection/drop off from local bus stop. European citizens must bring a EHIC European Health Insurance Card (E128). Medical Insurance can be arranged at a cost of approximately €40 for four weeks or under, €50 for six weeks or under, €55 for 12 weeks or under. Bank Holiday Mondays, there will be no English classes, students are offered an excursion in place. "Very good experience, I have enjoyed a lot!!" Thanks Cloe, delighted to hear you enjoyed yourself with us. "Really fine accomodation, quite new, clean and fantástic and warm staff. Good Link and coordinación between B&B and english class. Perfect location. Surfing class with profesional instructors, capabilities and instalacions "
"Thank you for welcoming and taking care of my groups and me with your special friendliness and professionality. The guys had a fabulous time studying, horseriding, kayaking, surfing. We all greatly enjoyed multiactivities with your nice, exciting and helpful coordinators. We have plenty of nice memories which will be for ever. Our eyes are full of “Green and Magic Ireland”. My stay was so relaxing and enjoyable: talking, mingling and laughing. It was just a wonderful time from start to finish. You’re are a guarantee for our school and I hope I’ ll be given the chance to come to you again next year!" "I want to thank you for a wonderful week Jannik had at your school. He had a lot of fun in Ireland and want to come back especially to surf again. Maybe also to speak english, who know’s? Thank you for your care for Jannik as well." "It was a really good experience. The English lessons were interesting and the surf was really really good !" "It’s the second time I come back and it’s still really good. I had a great time here. Now I have really good friends from all over Europe! Thank you I had so much fun."